The last book I covered in the previous post is Mythology by Edith Hamilton. The next book is “Vacanze Matte” by Richard Powell (1964). It’s the Italian publication of “Pioneers, Go Home” (1959). 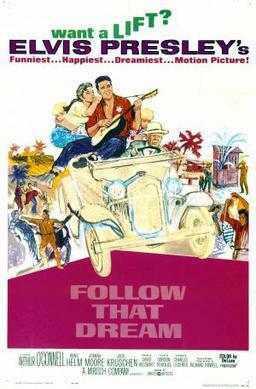 The book was poorly adapted and greatly miscast into the movie Follow That Dream (1962), with Elvis Presley. I won’t summarize the plot here as one can read the Wikipedia entry. What I will say is that I’ve only read this book in Italian, and did so when I was 11 . It is a very funny book, at least in Italian. Frankly, I don’t see how English could match the tone and cadence of the Italian language edition, and I’m not going to try and find out. For reference, here’s the Italian cover. I won’t recommend the American version because I don’t know it, but if you can read Italian, go for it! I picked up the next book in the used book section at Goodwill. Fantastic Realms by V. Shane purports to teach you to draw your own illustrations for the fantasy novel every writer has in the works. In High School and College I used to draw to pass the time. Sometimes I copied existing things, sometimes I made up stuff in the style of Jacovitti. I wasn’t great, but I wasn’t bad, either. I bought this book because I’ve always meant to get back to drawing. I probably never will, but the book – along with other guides I’ve accumulated over the years – serves as a placeholder for yet another of my wistful dreams. Here’s some examples of the content . . .
Now, for me it’s a little frustrating because it seems deliberatively deceptive. Look at the first sketch on the first page. I could do that. Look at the second sketch . . . I’m pretty sure it takes more skill than I have to just throw those details in there, and my efforts would not end up look like that. Look at the dragon drawings. Again, a big jump between the first and the second, and then finishing touches, right? Someday I may yet master the techniques shown here, but I’ll do it through other venues since the book does not explain much. Here’s another example of the step-by-steps associated making a drawing of a room. Child play, right? I mean what idiot would not be able to follow these instructions? Well, Bob, it’s not as easy as it looks. For one, like everything else one does in life, you can’t just jump in and do well. It takes practice. But for now I can hold on to the dream I am just a few pages and a free afternoon from opening my own cartooning business. Of course, if I am to become a cartoonist, I need to look the part! I need to get in shape! Enter “A Practical Approach to Strength Training” by Matt Brzycki. I have the 1991 Second Edition (cover shown above), but the link will take you to the 2012 4th Edition. The book is pretty good at covering not only the mechanics and physics of strength training, but the genetic and practical factors as well. Unlike other offerings I’ve seen, it does not promise to make you something you are not. During the time I played racquetball I did very little weight training. Once I quit RB I started going to the gym six days a week. I don’t want to do much beyond retaining my strength as I age, but because I no longer play RB and am doing more weights I now have more muscle mass than I’ve ever had in my life (no, not entering contests anytime soon – I don’t like getting all oiled up). I’ve cut back the weights to only two days out of six, the other four concentrating on a cardio-only workout.
. . . and no, I’ll never look like the guy on the cover. 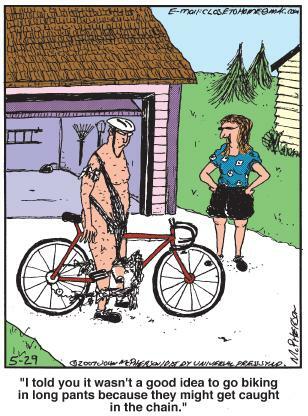 And now, a random cartoon about exercising. You can’t see the next booklet in the lineup very well because it is rather thin . . . The year was 2003, and texting was catching on, and Verizon wanted to encourage it (it’s always about money), so I received this booklet. It’s about 40 pages divided into two; the first part has “English to Text Message” . . .
. . . and the second part has “Text Message to English” . . .
As you can see, all one needs to transform oneself from a relic of the older generations to “ebkac” is to study this book . . . for them not hep like me, that translates to “error between keyboard & chair”. Most entries are acronyms from the words (moving right along – mra), but some are amazingly clever (Sleep or sleeping – zzz). I had not looked at this booklet for a long while, but having spent a few minutes going through it, I already feel sth. I have two copies of this next book; one I bought, and another was part of an introductory offer for a SF book club . . . I am a bit conflicted about Barlowe’s Guide to Extraterrestrials by Wayne Douglas Barlowe. I think I have the 1987 reprint since I did not start reading science fiction until 1983, but that’s not why I am conflicted. It’s the same issue I have with movies; I read a book, envision the characters and places, and then I see an interpretation of them on screen, and I’m disappointed it’s not like what I imagined. For instance, I am a big fan of Ringworld by Larry Niven, and my favorite character in the book is Nessus, a Pierson’s Puppeteer. So, here’s the problem . . . I have no preconception for some of the creatures from various books (heck, some I had never heard about until this illustrated guide), but for some I had specific visualizations, and my visualization of Nessus did not match the illustration. In this particular case, the coloring and details seemed wrong to me; too bright, too angular, and too blue. But, hey; I’m just the reader. By the way, the only film adaptation that came amazingly close to my visualization of places and creatures described in the books is the Lord of the Rings trilogy. If anything, the book crystallized my visualizations rather than conflict with them. The last part of the book has various illustrations (not sure if they are working sketches) of the creatures in action poses. In those oh-so-much-simpler pre-Internet days, this was indeed a special treat for the fan of the genre. The next slim pamphlet (the last thing I’ll cover in this post) is something we saved from when we moved here . . .
. . . and it still has my original reminder to save it. Not that’s I reference it for anything, but it does have information for the community I live in, including comparative demographics. Of course, now everything is electronic . . . Tri-Lakes Demographics. I don’t know how useful the information is because the numbers don’t jive, but since it’s only of passing interest, I can’t be bothered to get to the bottom of it. Thank you for reading this Fourth installment, and I hope you join me for the remainder of the rivetting progression through my library. Lots of good stuff to come, if I do say so myself (I usually have to, as few others ever speak so of me). 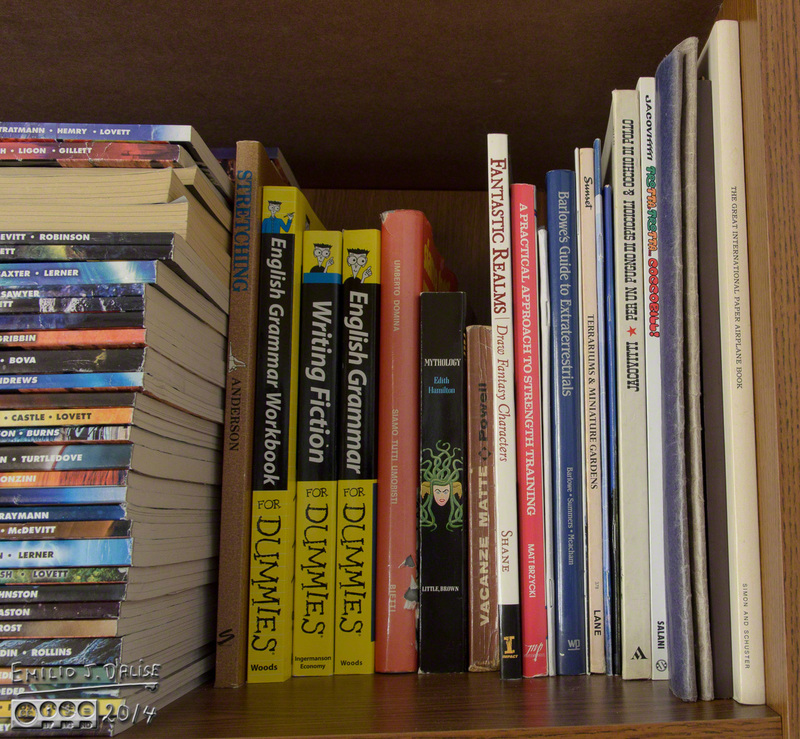 This entry was posted in Reading, Writing Stuff and tagged Books, reading, writing. Bookmark the permalink. There’s lots of interesting stuff here. So why am I focused on the .2% individual poverty status in Gleneagle? It’s Texas! Can’t they just get rid of that guy? It’s Colorado . . . they like to keep up appearances. Probably their token poor family everyone pitches in and helps so they can feel good about themselves (the 99.8%, not the 0.2%). Ha! I wonder if I’m a weirdo for always spelling out all the words in my text messages?! I especially liked the sketches in the Barlowe book! Thanks, and there be more coming. Interesting mix you’ve got here, E. “Fantastic Realms” is very much like many of the how-to draw or paint books and DVD’s I have: the instructions lack enough steps and details to attain the same results, thus creating unwanted frustration and the decision to quit. Frustration is not a reason to quit. Depending on the frustration, it could be a reason to work harder and getting better teaching aids.